The corollary of Rahm’s Law is that the government will tend to create crises so that we will need more government to fix them. A case in point is stock buybacks. Senators Chuck Schumer (D-NY) and Bernie Sanders (D-VT), who is running for president as a socialist, long for the good old days. They believe that our nation’s glory days can be restored by limiting corporate stock buybacks. They said so in a 2/3 NYT op-ed. According to the two senators, the 1950s-70s were a golden age for workers because “American corporations shared a belief that they had a duty not only to their shareholders but to their workers, their communities and the country that created the economic conditions and legal protections for them to thrive.” However, in recent decades, corporate managements and their boards of directors have become greedy, focusing on maximizing “shareholders earnings” at the expense of workers’ earnings. The result has been the “worst level of income inequality in decades,” they claim. The two senators, who have never managed any business, intend to fix this problem. They are planning to introduce a bill that will prohibit any corporation from buying back its shares unless it first provides a minimum wage of $15 an hour and a basic package of employee benefits, which presumably the bill will spell out. The senators recognize that corporations would respond by paying out more in dividends if they can’t buy back their shares. They promise more legislation to deal with that issue if necessary, maybe by amending the tax code. I humbly offer our two senators a bit of good advice courtesy of Erasmus, from his essay In Praise of Folly: “Let not the wise man glory in his wisdom: the reason is obvious, because no man hath truly any whereof to glory.” I am from Yardeni Research, and I’m here to help. 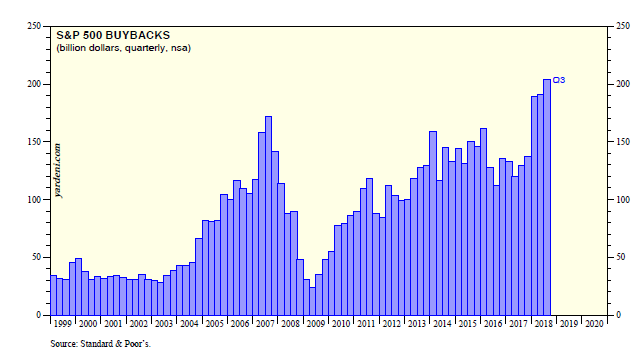 (1) SEC eases the rules on buybacks. Not widely known is that for many years after the Great Crash of 1929, the Securities and Exchange Commission (SEC) viewed buybacks as bordering on criminal activity. That was the case up until the Reagan years, when the SEC began to ease the rules on buybacks under John Shad, chairman from 1981 to 1987. 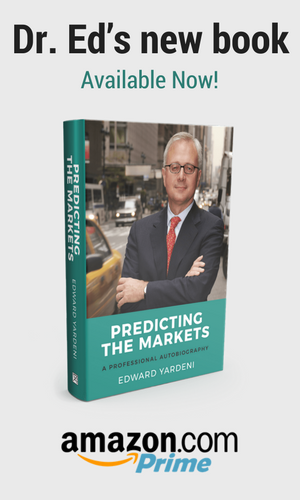 He believed that the deregulation of securities markets would be good for the economy. In a widely read September 2014 Harvard Business Review article titled “Profits Without Prosperity,” William Lazonick, a professor of economics at the University of Massachusetts, argued that buybacks are effectively a form of stock price manipulation. The article was a big hit with progressive politicians like Senator Elizabeth Warren (D-MA), who is running for president. (2) Bill Clinton inadvertently boosts stock compensation for top execs. Granted, some corporate executives are paid too much and spend too much time boosting their stock prices—purportedly under the banner of “enhancing shareholder value.” They claim that high compensation and rising stock prices (most of them are shareholders)incent them to work hard to manage their companies very well. The law of unintended consequences trumped the new tax provision, which had a huge flaw—it exempted “performance-based” pay, such as stock options, from the $1 million cap. Businesses started paying executives more in stock options, and top executive pay continued to soar. Liberal critics, notably Senator Warren, concluded that the 1993 tax-code change had backfired badly and that soaring executive pay has exacerbated income inequality. (3) Buybacks don’t boost earnings per share. The widely believed notion that buybacks boost earnings per share by reducing the share count isn’t supported by the data S&P provides for the S&P 500 companies. It’s true that from 2008 through 2017, S&P 500 companies repurchased a whopping $4 trillion of their shares, as the senators state in their op-ed (Fig. 1). 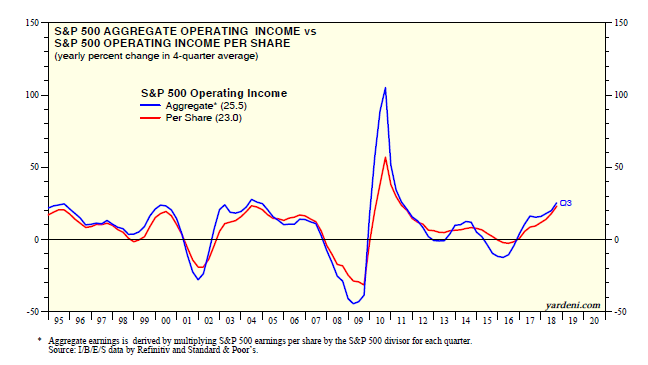 However, the spread between the growth rates in S&P 500 earnings per share and aggregate S&P 500 earnings has been tiny since the start of the available data during Q4-1994 (Fig. 2). To calculate per-share earnings, the S&P divides aggregate earnings by a “divisor,” which ensures that changes in shares outstanding, capital actions, and the addition or deletion of stocks in the index do not change the level of the price index (Fig. 3). From the start of 2008 through the end of 2017, it is down just 2.6%, or 0.3% per year on average. That certainly doesn’t support the notion that buybacks have reduced the share count meaningfully, thus boosting earnings per share. So the latest bull market has been driven by rising earnings, but they haven’t been artificially boosted on a per-share basis by stock buybacks! Nevertheless, buybacks might have provided a lift to stock prices since the buybacks occur in the open market, while the issuance of stock as compensation has no immediate market impact, especially if not yet vested. What about the claim that corporations have been spending almost 100% of their profits on buybacks and dividends rather than expanding and improving their productive capacity and workforce? It is factually accurate (Fig. 4). The problem is the claim’s underlying assumption that the biggest source of corporate cash flow is profits; rather, it is depreciation allowances. This is the corporate income that is sheltered from taxation to reflect the expenses incurred in replacing depreciating assets. It’s this cash that nonfinancial corporations (NFCs) mostly use for gross capital spending—which rose to a new record high during Q3-2018 and continues to rise in record-high territory (Fig. 5). Recent net capital spending by NFCs is comparable to levels in previous business-cycle expansions, though making such comparisons may understate the technological enhancements in current spending (Fig. 6). (1) Record employment and quits. Granted, it took longer than usual for payroll employment to recover from the previous recession, which was among the worst since World War II. However, by May 2014, payroll employment did regain what was lost during the severe downturn. It too has continued to move higher, and hit 150.5 million during January, surpassing the previous cyclical peak during January 2008 by 8.8%. The unemployment rate has been running around just 4.0% since March 2018. Job openings is at a record high, exceeding the number of people unemployed since last March. The quit rate is around record highs, as workers have lots of alternative prospects for boosting their pay and their benefits. (2) Record income and consumption per household. Perhaps one of the biggest myths of all about our economy is that real incomes have stagnated for most Americans over the past 15-20 years. Even Donald Trump often made this claim when he was running for president. This assertion is based on one widely followed and extremely flawed inflation-adjusted measure of median household income produced annually by the Census Bureau (Fig. 7). It is based on survey data, focuses just on money income, and is pre-tax. From Q1-2000 through Q4-2017, real GDP per household rose 19.7%. Yet over this same period, the aforementioned income series, which is available only on an annual basis, rose just 2.2%. That’s stagnation for sure, and implies significantly worsening inequality. However, there are numerous other inflation-adjusted measures of household income and wages that are based on hard data and are broader in scope, including nonmoney government support programs like Medicaid, food stamps, and tax credits. They are up much more over the same period. For example, real personal income per household is up 27.0% before taxes and 29.9% after taxes. Skeptics will instantly pounce on the fact that these are means, not medians. So they might be upwardly biased by the enormous incomes of the ultra-rich. I doubt that, as evidenced by real personal consumption per household, up 28.1%. The rich don’t eat much more than the rest of us. My basic assumption is that there aren’t enough of them—often dubbed the “1%” for a reason—to bias the mean series I’ve constructed for personal income and consumption. (3) Record real wages and compensation. There can be no disputing the fact that real wages haven’t been stagnating at all, notwithstanding the assertions of the two senators who want to help workers. From the start of 2000 through the end of 2017, real average hourly earnings rose 17.3% (Fig. 8). I am using the series that applies only to production and nonsupervisory workers, who tend to be rich only if they win the lottery. They account for roughly 80% of all workers. There’s more: Total real compensation—which includes wages, salaries, and benefits, per worker (using the household measure of employment)—rose 19.5% from the start of 2000 through the end of 2017, and was at a record high last year, as were all the other measures mentioned above (Fig. 9). A July 2016 working paper authored by a team of economists—three from the Bureau of Economic Analysis and one from the University of Michigan—created a median measure of personal income. The economists found that it grew by 4.0% from 2000 to 2012, while the Census’ median money income fell 6.2%. That’s certainly a significant difference! The study came to the following significant conclusion: “We show that for the period 2000–2012, inequality using personal income is substantively lower than inequality measured using Census Bureau money income, and the trends in both inequality and median income are different. This demonstrates the importance of using a national accounts based measure of income when examining the relationships between inequality and growth.” This extraordinary statement completely debunks using Census money income to measure not only income inequality but also the standard of living. The data cited above strongly suggest that the standard of living of the average American household hasn’t stagnated, and has increased along with real GDP since 2000. If so, then income inequality hasn’t worsened much if at all since then. That doesn’t mean that there isn’t any income inequality, but rather that it is just as bad now as it was back then but no worse. Remember that inequality was an issue under President Clinton, who addressed it by capping cash compensation at $1 million for top execs in 1993. The bull market in stocks undoubtedly has worsened wealth inequality since it started in early 2009. However, lots of Americans have benefitted from the bull market through their pension programs at work, including 401(k) plans and individual retirement accounts (IRAs). The latest data available from the Investment Company Institute show that in 2016 about 55 million American workers were active 401(k) participants. The value of their 401(k) funds was $5.6 trillion as of September 30, 2018. The Fed compiles quarterly data on the value of all IRAs, which rose to a record $9.3 trillion during Q2-2018, up $5.7 trillion since the start of the bull market (Fig. 10). Progressives like Senators Schumer and Sanders want to reduce corporate cronyism. I wholeheartedly agree with them on that, and I have some ideas on how to do so, including limiting the number of boards on which an individual may serve and compiling a “crony scoreboard” to keep track. Corporate cronyism may become a bigger problem, in my opinion, because shareholders are losing their influence over corporate managers and boards as a result of the outflows from equity mutual funds into equity ETFs. Active managers exert more shareholder influence over corporate governance issues than do passively managed funds. There is certainly room for improvement in corporate governance. On the other hand, I see no need for regulating buybacks. Most corporate managers are driven to make their companies as successful as possible, as evidenced by record earnings both on a per-share basis and in aggregate. America’s free-market capitalism continues to boost the prosperity of most Americans, in my opinion, without more help from the government. Finally, let’s recognize that income and wealth inequality are inevitable consequences of a system of free-market capitalism. The rich do tend to get richer, especially when the rest of us also prosper along with them, since they benefit from consumers with more purchasing power to buy what their companies produce. Socialism does create more equality, but that’s because it tends to generate less growth for the economy and less prosperity for most people. Take your pick. In this video podcast, I review the latest developments in the US federal government's budget and I explain why I disagree with the proponents of Modern Monetary Theory who claim that deficits and debt don't matter as long as the government borrows in its own currency and inflation remains subdued.